In 2018, we have workshops planned for two of our exhibitions Soft Topologies and Void. However if Sport, CGI and data collection or the impact of coding on 3D printing and design interest you, please get in touch as our other two exhibitions Clanger by Baden Pailthorpe and Hello World curated by Aaron Seymour reflect on these areas. If you are interested in participating in our existing program or developing a workshop plan to suit your students and curriculum please send us an email to discuss. Encompassing adaptable textiles, sculpture and video, Soft Topologies is a solo exhibition that explores points of convergence between mapping the body and mapping the stars. 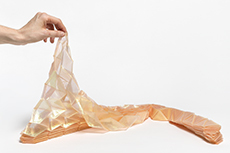 Scardifield’s art practice, inspired by astronomy, explores the materiality of textiles by using fashion design techniques such as heat-set pleat molding, hand appliquè and dissective cutting. Her wearable sculptures are investigated further through video, capturing the works as they interact with the body. The result is a haunting dance of colour and form. This practical workshop will allow students to develop hands on skills in the manipulation of textiles through the use of appropriate technologies and develop an understanding of image making, working with found objects and performance. Image above: Kate Scardifield Soft Topology, Hand pleated and heat-set polyester organza, cotton thread, black tourmaline. 185 x 120 cm. Image: Document Photography. Courtesy the artist and ALASKA Projects. 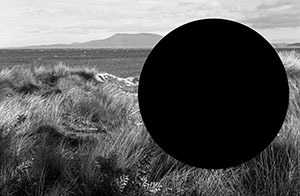 Void is a group exhibition focusing on the work of Indigenous artists which explores the multiples ways in which artists visually articulate the unknown as space, time and landscape. The exhibited works span painting, photography, ceramics, sculpture, woven works and works on paper. This workshop will give students the opportunity to consider a variety of Indigenous artists’ voices from across Australia using the concept of ‘void’ as a starting point to delve deeper into the complexity of Indigenous culture. The workshop will have a yarning component led by an Indigenous educator and a making component where students can physically explore the language and concepts developed through the discussion. Target audience: Primary and Secondary. We encourage students from all cultural backgrounds to attend this workshop however Koori clubs and schools with high Indigenous populations are particularly welcome to book. Some schools will be eligible for free transport between school and UTS. Image above: James Tylor (Deleted Scenes) From an Untouched Landscape #7 inkjet print on hahnemuhle paper with hole removed to a black velvet void. 50 x 50 cm. Courtesy the artist and GAGPROJECTS.